One minute, you're barely scraping into the top 40; the next, you're winging your way towards your first top 10 hit. Yep, just like that, fortunes can change on the ARIA chart - and this week in 1989, a male artist who was having a massive year in the States debuted with the song that'd help him cross over in Australia. At the other end of the top 50, Richard Marx vacated the top spot for Cher to finally hit number 1 after decades of trying (the closest she'd previously come was on Sonny & Cher's 1965 number 2 hit, "Sing C'est La Vie"). But Jive Bunny was closing in fast - for how long could "If I Could Turn Back Time" hold off "Swing The Mood"? 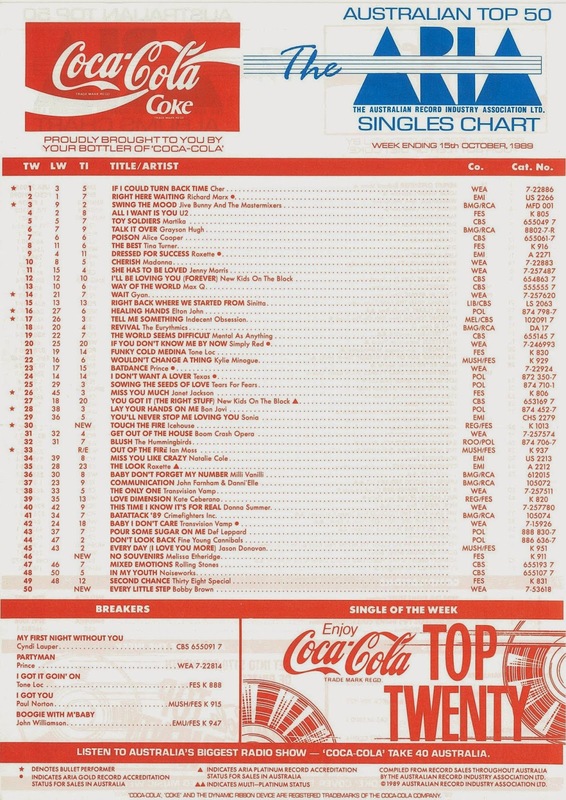 "My Prerogative" had reached a disappointing number 40 back in May and next single "Don't Be Cruel" (which had actually been released first in the US) hadn't even managed to crack the top 50, so you would've been forgiven for thinking from this dismal entry position that Bobby Brown was destined for another flop. Thankfully, that assumption would've been wrong, since "Every Little Step" not only out-performed "My Prerogative" but climbed all the way up to the ARIA top 10. Already a major star in the US, Bobby - who gave Collette a run for her money in the lyrca stakes in this clip - was the king of new jack swing, a genre that hadn't really taken off in Australia. Although, I'd suggest that "Every Little Step" succeeded because it was as much a pop song as an R&B track. Compared to most of the other US hits written and produced by LA Reid & Babyface for the likes of Karyn White, Pebbles and even Sheena Easton, "Every Little Step" was positively joyful - and I think that had something to do with its success here, while those other moodier songs faltered. With one major hit under his belt, Bobby, his wedge haircut and running man dance were soon unstoppable - and the door was now open for more American R&B music to be given a chance in Australia. Unlike Bobby Brown, Melissa Etheridge had been embraced by Australia some time before America sat up and took notice. So it was no surprise when her second album, Brave And Crazy, stormed into the ARIA top 20 and this week jumped up to number 11 - but hit singles weren't as forthcoming this time around. In fact, "No Souvenirs" would be the only chart hit from the album - and it's a song I don't really recall, but I did make an effort not to have to listen to Melissa Etheridge if I could help it. This really should have been a bigger deal - the first new Icehouse single since Iva Davies and co stopped trawling Man Of Colours for singles in July 1988. While number 13 is nothing to sniff at, it must have been a bit of a disappointment after the level of success Icehouse had become used to. After all, Man Of Colours was one of those albums nearly every Australian household owned, so you'd think "Touch The Fire" might've made more of an impact - especially given it's a pretty good song. Be that as it may, the single did at least do its job of promoting the forthcoming Icehouse career retrospective album, Great Southern Land, which was released at the end of October 1989 and featured two new tracks, of which "Touch The Fire" was one. While "Touch The Fire" didn't become Icehouse's seventh top 10 hit, Great Southern Land, at least, reached number 3 on the albums chart. 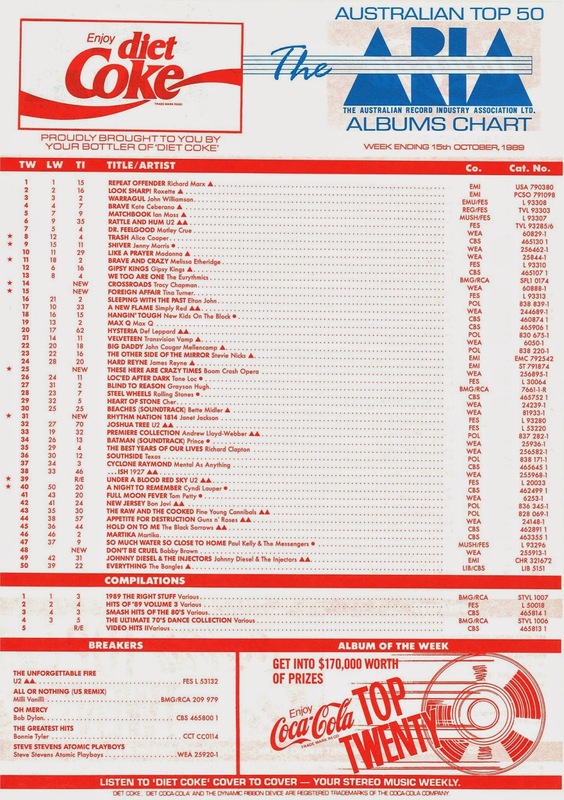 Speaking of the albums chart, with only three new entries on the singles top 50, what better time to flip the chart over and look at what was happening on the other side? 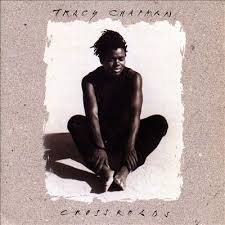 As well as Bobby Brown's year-old Don't Be Cruel album finally cracking the top 50, it was a big week for new entries on the ARIA chart, with brand new albums by Tracy Chapman, Tina Turner, Boom Crash Opera and Janet Jackson all debuting. 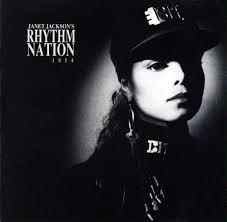 Despite charting lowest out of those four titles this week 25 years ago, Janet's Rhythm Nation 1814 would end up being the biggest hit, spending four weeks at number 1 - although not until February 1991. 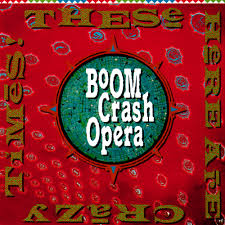 Tracy Chapman's second album, Crossroads, would peak at number 4 while These Here Are Crazy Times by Boom Crash Opera reached number 10. 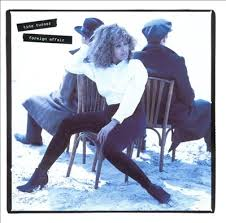 As for Foreign Affair by Tina Turner - its number 15 debut was also its highest position. 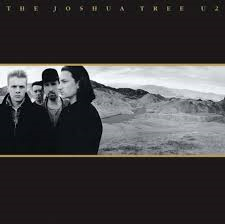 It doesn't take a genius to work out why there was a sudden influx of old U2 albums in and just outside the top 50 this week in 1989. After all, the Irish band kicked off their Lovetown Tour in Australia in late September. 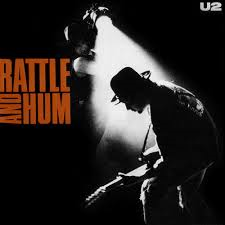 Meanwhile, latest album Rattle And Hum climbed back up the top 10 and to its highest position since December 1988. What would a look at the albums chart be without checking out what compilations were selling by the truckload? This week in 1989, 1989 The Right Stuff had the upper hand thanks to the number 1 singles from New Kids On The Block and Simply Red it contained. The top-selling compilation also featured big hits by Indecent Obsession, Grayson Hugh, Texas, Sinitta and Transvision Vamp. 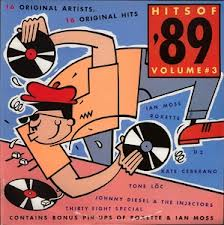 The third volume of Hits Of '89 had no chart-toppers, but did include big singles like "All I Want Is You" and "Dressed For Success". It deserved to lose the chart race, however, thanks to a dire second side which featured non-hits from Nick Barker & The Reptiles and Easterhouse. As the decade drew to a close, it was a good time for a Smash Hits branded compilation covering the best the '80s had to offer - and Smash Hits Of The '80s did a decent job of fulfilling its remit, even if a couple of the inclusions (Paul Kelly & The Coloured Girls, The Black Sorrows) seemed out of place. They were hardly decade-defining moments. Skipping over the '70s compilation, poor Video Hits 2 really did suffer on the tracklisting front. 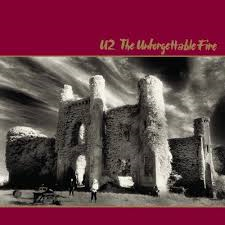 Only five of the 16 songs included were top 10 hits, while acts like Then Jericho, Roachford and Deacon Blue somehow made the cut (or were forced upon the compilers by record labels). Next week: two of the year's biggest new acts debut with new songs - and score three simultaneous top 40 hits in the process. Meanwhile, a rock band that started life in the early '70s lands its first top 40 hit. Before that, I'll conclude my look back at my favourite 100 songs from 2009. From Countdown Revolution, Prince's 'Partyman' was at #52 this week, which must mean Cyndi was at #51. I'm surprised to see 'My First Night Without You' back as a Breaker, 3 weeks after cracking the top 50. I wish ARIA didn't re-list singles that had already entered the top 50 as Breakers; maybe we could have found out another Breaker from this week that didn't hit the top 50 in its place. I also noted down Richard Marx's 'Angelia' being at #93 on 17/10/1989, from Countdown Revolution. Though I'm not sure if that meant it was from this week's chart or the next one, given that it would have been a Tuesday. I liked 'Every Little Step' and remember there being a 'no rap' b-side, which I assume must have had about a minute of just the instrumental track playing in place of the rap, given how long the rap section lasts. 'Don't Be Cruel' (single) would eventually crack the top 50 as part of his megamix hit, as would Paula Abdul's local flop singles. Fox FM in Melbourne were plugging 'No Souvenirs' for several weeks before it entered the chart. I remember being surprised that she had a new song out from a new album already, so quickly after the first. I didn't really like the 'rock' sound of the Icehouse track, and thought the verses and bridge were much stronger than the chorus. It was probably a career mistake for Icehouse to follow-up 'Man of Colours' with a best-of collection (that curiously featured none of the 'Man of Colours' singles) 2 years later, rather than a new album. Donna Summer finally cracked the top 40 this week after what must surely be one of the longest climbs within the top 50. I'm surprised Tina Turner's album didn't peak higher. I got (and probably asked for) '1989 The Right Stuff' for my birthday that year, though by that point most of the songs on it were pretty 'old'. I also got a Nintendo, after playing and getting hooked on a family friend's kid's Super Mario Bros. game. It was quite funny when the 'hits' compilations had to resort to using non-hits. I wondered why none of Kylie's actual hits from 'Enjoy Yourself' were featured on one of these compilations until 'Tears On My Pillow'. Jason's 'Too Many Broken Hearts' and 'Sealed With a Kiss' also didn't appear on the main compilations, curiously. Madonna's 'Cherish' was on one of them, but none of the other 'Like a Prayer' singles were. Maybe some of the 'big' acts wouldn't allow their singles to appear on these things until the album had already had a fair run in the chart? I remember thinking 'who would buy that?' about the Smash Hits decade collection. I guess as a 10-11 year old, I couldn't yet see why anyone would want to buy 'old' hits... and if they did, surely it wouldn't have been a collection affiliated with a teen magazine. The 2-cassette version came in a special double-size case (like 2 cassettes placed alongside, rather than stacked on top of, each other) from memory. I bought 'Video Hits 1' the year before, which featured a mixture of chart successes and flops; but more evenly balanced than '2', which I passed over. I thought the purpose of including some flops/newer artists may have been to help them gain exposure; a bit like a promotional release. Both (and subsequent) Video Hits releases should have really been available on VHS though; that would have been more interesting, and fitting the show's name. 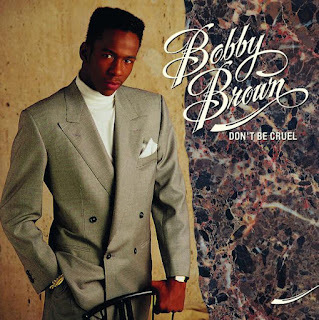 My friend bought Bobby Brown's 'Don't Be Cruel' around December 1989 and he played it all summer and I got to know all the tracks and every word without owning the album myself. 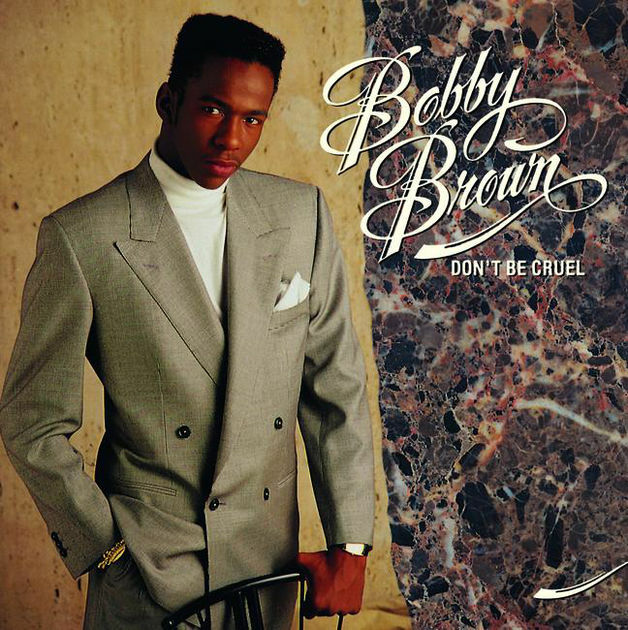 I always thought about buying it on CD in the 90's but never got around to it and well by mid 90's Bobby Brown was no more. 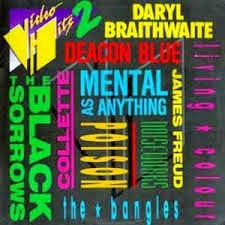 Wow, I now remember seeing the 'Video Hits 2' compilation in the record store after seeing the image here. I always thought about buying it just to hear some new songs that weren't hits, but the others were old hits, so I passed on it. Nathan, as you mentioned, it is funny how some of the big artists don't get their songs on the compilations until the shelf life of their album is over. Madonna did it a few times. Her 5th and final single from 'True Blue' - 'La Isla Bonita' ended up on '87 Hots Up' (should have been '87 Right On Track' cause it was a bit old by now) and 'Dress You Up' on 'Just Hits 85/86 and as you mentioned 'Cherish' being on 'Let's Do It - Summer 1990' (even though it was only the 3rd single and still 3 more to come, which didn't do much). My local FM station played 'No Souvenirs' quite a bit when it was released. 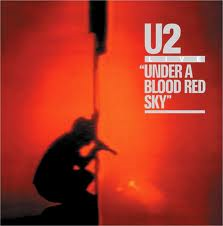 I like it, it was different, not your typical hit and very lyrical.